With over 600 views and counting, the following YouTube video of Longmont City Councilmember Sean McCoy shows him at his nastiest best, or worst depending on your perspective. Unless you know what he’s talking about here, it’s pretty hard to follow his usual style of stumbling his way through a prepared speech. For background, here’s the original piece explaining what occurred that brought on his wrath dripping with hate. Readers digest version: Sean McCoy tried to get the City Manager to outlaw people that he (Sean McCoy) disagreed with politically from having booths at city events . That’s pretty much it in a nutshell, and I do mean nutshell. This was prior to the 2009 election where this “small disconnected fringe group” mopped up the floor with Councilmember McCoy’s pals, most notably Karen Benker, and some other footnotes to footnotes you’ve already forgotten about. Remember, this was the guy calling for a “Civility Committee”, although he called it “Richard Juday’s Civility Movement” in the following video. This particular movement probably needed more fiber as it quickly dissolved after the glowing recommendation by Sean McCoy. 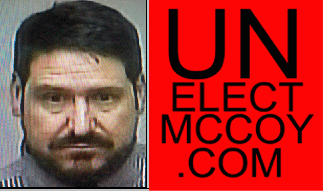 ON NOVEMBER 1ST, UNELECT SEAN MCCOY! Tagged Longmont, Richard Juday, Sean McCoy. Bookmark the permalink.